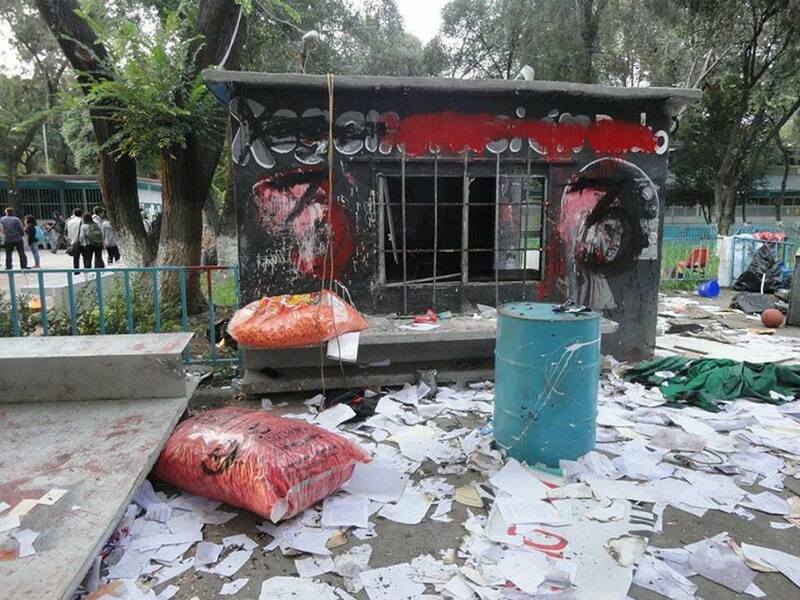 On 21 September, members of the shock-group Third of March violently entered the hall of the College of Arts and Sciences (CCH) at the National Autonomous University of Mexico (UNAM), attacking the activists who operate Regeneración Radio, destroying and robbing materiel and equipment. In a communique, representatives from the university condemned the events and reported that a penal denunciation would be presented to local and federal authorities whom they hold responsible for the acts and the damages incurred by the university. Students indicated to La Jornada that before 3pm, approximately 100 militants forcibly entered the hall and beat the activists who attempted to block their passage. UNAM reported that the confrontation left three injured, “none of them gravely.” José Luis Suaste, member of Regeneración Radio, said that members of the collective had been threatened and attacked for several days, and for this reason he reported on the existence of an “increase in violence,” the cessation of transmissions from the radio station, and called for the space to be defended. It bears mentioning that Heriberto Paredes, a photojournalist from the Autonomous Agency for Communication Subversiones, denounced a death-threat made against his person on 31 August in Mexico City. Previously he had received three death-threats on the phone on 15 May and 7 and 13 July, while on 10 June he was harassed at the same Metro station as this last occasion. In this way, another member of Subversiones received a death-threat via telephone on 2 June. Moreover, in September the home of journalists and reporters from Desinformémonos and the magazine Contralínea were broken into, while in August the journalist-activist Rubén Espinosa Becerril and Nadia Vera Pérez, human-rights defender, were murdered together with three other women in Mexico City. On the 9th of July 2009, representatives of the indigenous tseltales, who are members of the village of San Sebastián Bachajón and part of ‘La Otra Campaña’, took part in a press conference, together with the Centro de Derechos Humanos “Fray Bartolomé de Las Casas” (Human Rights Center “Fray Bartolome de las Casas” or CDHFB). 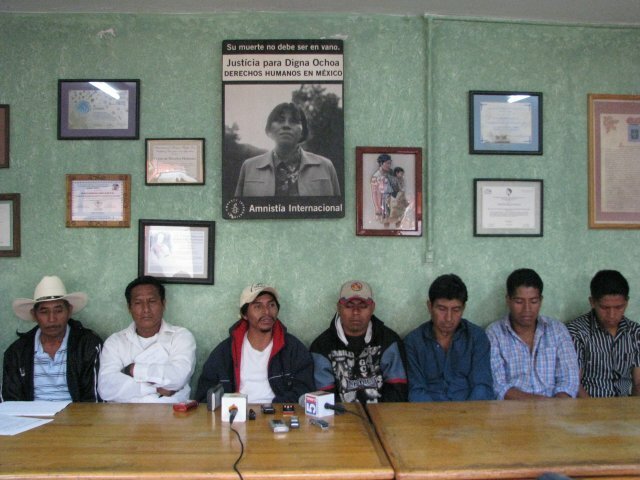 The press conference took place in the offices of CDHFB, with the aim of the liberation of five of the seven detained indigenous tseltales from the village. The detainees have been imprisoned since last April and have suffered acts of torture to incite confessions of responsibility for holdups of tourist buses in the region of Agua Azul. Gerónimo Moreno Deara acted as representative of those who had been recently liberated: he recounted the events of the detainment, the arrival, and the imprisonment within the state jail “El Amate”, which is based in Cintalapa. Gerónimo Moreno Deara recounted how they suffered torture for two days and how, on being detained, they were forced to take part in manual labor for the other prisoners so as not to be assaulted. Two of the authorities of the village, who represented the committee of surveillance, as well as the principal traditional authorities, spoke about the origins of division within the village and the way in which they joined the ‘La Otra Campaña’. They stated that they are going to keep fighting for the liberation of the two other members of the village who remain imprisoned. In turn, the CDHFBC, which acts in defense of the seven indigenous peoples who were detained last April, gave thanks to the national and international solidarity that has resulted in the recent liberation of the five individuals. Furthermore, the Center urged for those in solidarity to keep fighting for the freedom of Antonio and Jerónimo Gómez Saragos, who are currently imprisoned in “El Amate”. Moreover, representatives of CDHFBC stated that they were eagerly awaiting the resolution of the appeal against the order for the commitment of the defendant, which will be announced within the next few days. On Novermber 15 and 16, 2008, SIPAZ attended a gathering titled “Our Voices of Struggle and Resistance” at the Ecological Center in Juchitán de Zaragoza located in the Isthmus of Tehuantepec, Oaxaca. The 200 participants included various organizations such as the the Tepeyac Human Rights Center of the Isthmus of Tehuantpec, the June 14 Educator and Popular Collective, the Assembly for the Defense of Land and Territory, the Solidarity Group of La Venta, the Mexican Alliance for the Self-determination of the People, the Mexican Movement of those Affected by Dams and in Defense of the Rivers (MAPDER), the Mexican Anti-mining Network (REMA), the Union of Indigenous Communities in the Northern Zone of the Isthmus (UCIZONI) and Oaxacan Voices Constructing Autonomy and Liberty (VOCAL), as well as members of various communities in the region. The themes that were discussed in the meeting included: Struggle and Resistance in the Isthmus of Tehuantepec; The Mesoamerican Project and its components (including the Wind Energy Project and super-highway infrastructure); Agrarian Deregulation such as the Program of Certification of Ejidal Rights (PROCEDE) and the constitutional rights being violated; the Economy of Deprivation and Mega-projects; the Ecological Debt. On the second day of the meeting the participants visited the La Venta II and La Venta IV wind farms. 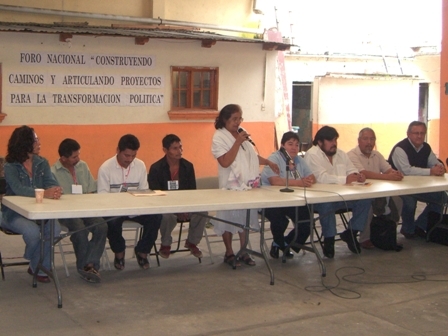 The meeting ended with a final declaration in which they stated “We pronounce a clear NO to the highway, dam, mine, and transnational wind energy projects, because they do not contribute to the development of our communities, instead they displace us and deprive us of our land … they only bring economic benefit for businesses and the government”. Below is audio (in Spanish) of Teodosio Ángel Molina of UCIZONI discussing the history of resistance in the area and his analysis to date. The Fray Bartolomé de Las Casas Human Rights Center (Frayba, Centro de Derechos Humanos Fray Bartolomé de Las Casas) reported the release on 15 October, 2008, of Marcelino Díaz González, member of “La Voz del Amate”, an inmate organization and adherent to the Other Campaign based out of the State Center for the Social Reinsertion of Sentenced Prisoners (CERSS, Centro Estatal de Reinserción Social de Sentenciados) No. 14 “El Amate” in Cintalapa, Chiapas. Marcelino Díaz González, born 2 June, 1980, from San Pedro Nixtal Uk’um, in the municipality of El Bosque, was a member of the campesina organization USISON and later became an adherent to the Other Campaign. He was detained 3 October, 2001 by the State Judicial Police (Policía Judicial del Estado) without an arrest warrant. According to Díaz’s testimony he suffered threats, beatings, and maltreatment such as the placement of a plastic bag over his head as well as being shut in a freezer for 12 hours. He was held under an administrative arrest (arraigo) for 30 days in an unofficial arraigo house, the Hotel Safari in Tuxtla Gutiérrez (no longer used to house individuals under arraigo). On September 19th and 20th, the National Forum “Construyendo Caminos y Articulando Proyectos para la Transformación Política” (“Building Paths and Developing Plans for Political Transformation”) occurred in Oaxaca. 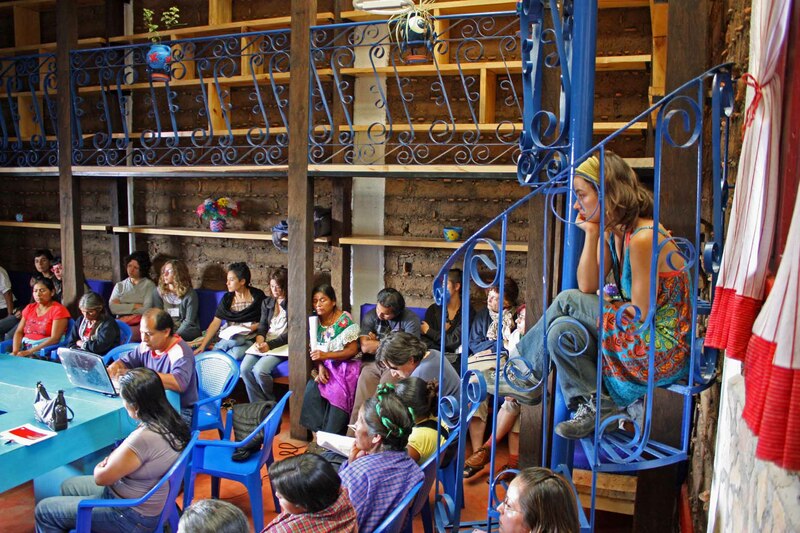 According to the organizers, the meeting was a gathering of 240 people; this included men, women, representatives and members of seventy-three social and civil organizations, including social movements from Chiapas, Morelos, Oaxaca, Guerrero, and the state of Mexico, as well as representatives from Australia and the United States. 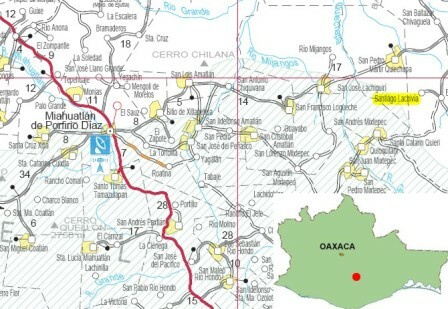 The final political declaration emphasized that “this event is occurring within the context of a serious institutional crisis and of a fragile democracy, in which we as a country are immersed; it is occurring within the many experiences of struggle and resistance from many diverse social movements in Mexico and through the necessity of re-articulating the social and political processes of the people of Oaxaca in the face of the authoritarianism of the government”. The proposed objectives of this event were: to generate a space of discussion for the diverse range of social movements in the country; to identify common elements between the national and local settings, as well as to reach a consensus on the priority courses of action within the social agenda. After the deaths of two indigenous campesinos August 5 in Santiago Lachivía, a community located in the San Carlos Yautepec district, the Union of Indigenous Peoples and Communities of Yautepec (UPCIYO, Unión de Pueblos y Comunidades Indígenas de Yautepec) assembled the “Caravan in Solidarity with the Indigenous Community of Santiago Lachivía” on August 18, 2008. SIPAZ conducted an interview with Evaristo Belleza Avila, the Communal Lands Commissioner of Santiago Lachivía in Oaxaca, in which he describes the events of August 5. He describes the community’s shock and confusion at the violence and expresses the need for an explanation from the governor and State Attorney General. He stated, “Right now we are hoping that there will be justice and that our government takes into consideration our request and our complaints.” A second interview was conducted with Leobardo Vasquez Hernandez, the ex-Communal Lands Commissioner of Santiago Lachivía, who gives a broad explanation of the historical context of the community. You are currently browsing the archives for the Audios category.